Cast: Jackky Bhagnani, Kritika Kamra, Pratik Gandhi, Neeraj Sood and Shivam Parekh. The essence of a good rom-com is the chemistry between the two protagonists. Everything else is just filler. But in a very good rom-com's, the filler is interesting as well. Director Nitin Kakkar's Mitron, who previously helmed Filmistaan (2012), is from latter category. If you are fond of watching a romantic drama with some laughs, a good cast, and a good heart, then Mitro is a delectable treat. 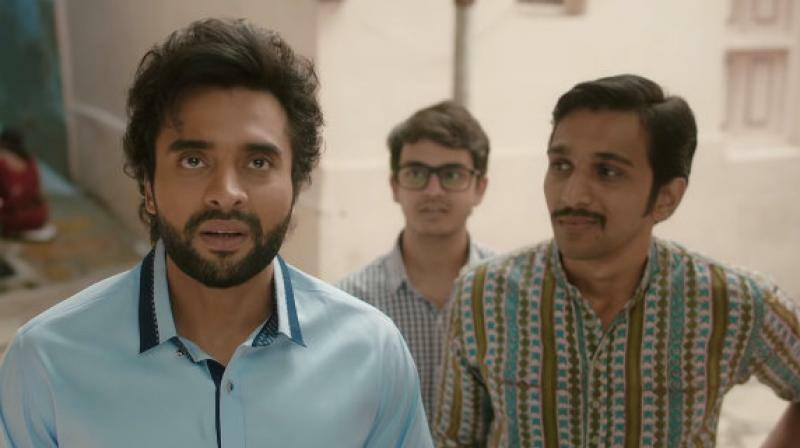 Set in the backdrop of the Gujarati milieu, the movie has a simple premise: Jai (Jackky Bhagnani) is a middle-class, happy-go-lucky lad stumbling toward responsibility. Jai's laid-back attitude doesn’t go down too well with his father (Neeraj Sood), who has bigger aspirations for him. Therefore, in order to bring stability in his life, his father decides to get him married. Enters Avni (Kritika Kamra), an ambitious, MBA graduate, who wants to start her own business. The film further traces Jai and Avni’s personal journey, as they both unexpectedly find their true calling in life. As far as the script goes, it is very basic and straight-forward. The story is nothing new but it's told in an interesting manner. The story is revealed through the occasional flash backs. The scenes are a little choppy, certainly at first, but this probably is a technique to speed up the opening part of the film. Director Nitin Kakkar does a commendable job by talking about generational gap and Indian marriage system without compromising on entertainment value. He has made a really entertaining, crowd pleaser. Mitron rises a level above from a typical Bollywood comedy the way it handles the character of its female protagonist. Kamra's Avni is fearless and practical yet simple and rooted. It's refreshing to see her calling the shots to a group of guys that includes our hero. Sharib Hashmi’s dialogues are clever and witty. Jacky Bhagnani does a very good job as Jai. He nicely underplays his restrained character and gives it a required quirk. Kritika Kamra looks natural on-screen and she is equally entertaining. The two of them are great together and fun to watch on screen. The supporting actors, especially Pratik Gandhi is wonderful as Jai's friend, Raunak. However, it's Neeraj Sood who steals the show with his small yet hysterical role as Gujarati father. Overall, Mitron is a good effort, but a little more editing of the script and more fleshed out characters would have helped a lot. Nonetheless, it is an entertaining watch with some wonderful moments, some genuinely funny lines, and good performances. Compared to a lot of what passes for comedy in the cinema these days, Mitron is great. It's certainly worth seeing.